The Virginia Institute of Marine Science (VIMS) and Longwood University's Hull Springs Farm have announced a strategic partnership designed to restore, enhance, and preserve 213 acres of wetlands, stream buffers, and streams on a portion of Hull Springs Farm. The Farm, a demonstration site for environmentally sustainable land management, is located on Lower Machodoc Creek, a tributary of the Potomac River in Westmoreland County, Virginia. During a signing ceremony held Dec. 8 at Hull Springs Farm, Longwood President Patrick Finnegan and VIMS' dean and director, Dr. John Wells, formally committed to future collaboration of the two institutions of higher education. 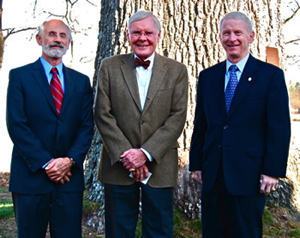 The Honorable W. Tayloe Murphy Jr., a former Virginia secretary of natural resources and a member of the Hull Springs Farm Foundation, officiated the ceremony which culminated in the presentation of acorns from the Farm's 400-year-old signature Southern Red Oak tree. The acorns will be planted on the VIMS and Longwood campuses, symbolizing the long-term growth and strength of the partnership. Under the partnership, VIMS of the College of William and Mary will continue to function as an adviser in establishing a self-sustaining, forested wetland that will also function as a wetland mitigation bank and provide educational and research opportunities for the students and faculty of Longwood, VIMS, and other universities. "Hull Springs Farm is already a leader in experimental living-shoreline technologies to stabilize shoreline and create wildlife habitat," said Finnegan. "With this major wetland and stream restoration project, and the technical expertise of VIMS, Longwood is furthering its commitment to improve water quality and wildlife habitat on the Farm as well as in the Chesapeake Bay watershed. The goal of the partnership is to offer the undergraduate and graduate students of both institutions innovative educational and research opportunities, while improving water quality for Chesapeake Bay." Well says "The Center for Coastal Resources Management at VIMS has played a pivotal role in helping to create the plan for this wetland and stream restoration, and our faculty and staff have provided technical assistance on other major environmental projects on Hull Springs Farm since 2004. There is great potential that this dynamic partnership will ensure high-quality educational and research opportunities, help improve water quality, and provide support to sustain the mission of Hull Springs Farm." Dr. Kirk Havens, assistant director of Center for Coastal Resources Management at VIMS, first visited Hull Springs Farm in 2004. "This ceremony formalizes a win-win collaboration that brings together two educational and research institutes," he said. "For students, the collaboration will offer educational and research opportunities that draw on the talents and expertise of each partner institution, as well as the unique habitats of Hull Springs Farm. The living shoreline project is a demonstration site for the public, contractors, wetland board members, and the ecological restoration community. We foresee a long-term collaboration." Bobbie Burton, executive director of Hull Springs Farm, praised the partnership. "With overlapping missions, we have collaborated since 2004 on developing conservation models especially in regard to shoreline erosion and wetland restoration. VIMS has participated in educational programming and provided technical assistance in the development of the Northern Neck's most successful living shoreline installation and research project at Hull Springs Farm." Hull Springs Farm, which consists of 662 acres in the Mt. Holly area of Westmoreland, was bequeathed to the Longwood University Foundation Inc. in 1999 by Mary Farley Ames Lee, a 1938 Longwood alumna. The mission of this effort is to manage and develop Hull Springs Farm as a compelling model of conservation and stewardship to educate the students of Longwood University, other institutions, and the greater community about their role in creating a more sustainable planet.